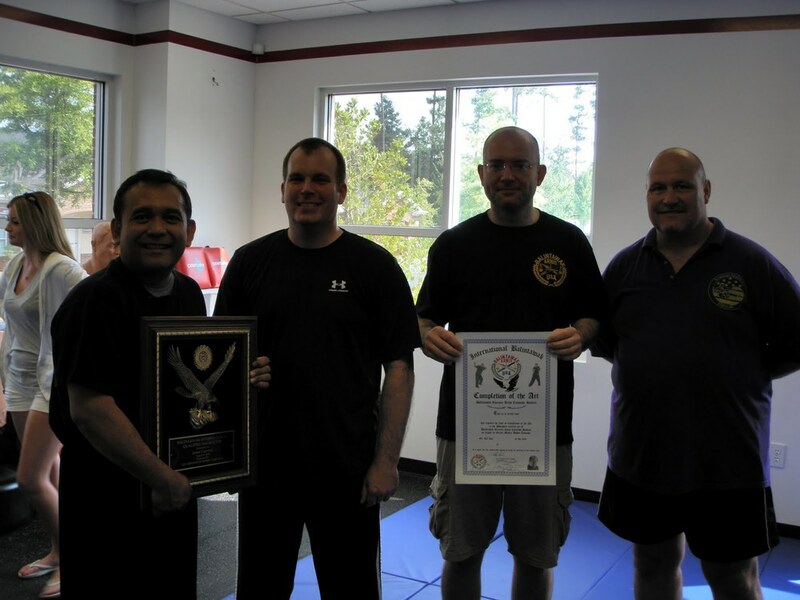 Every year members of the International Balitnawak Group gather from all corners of the globe for a weekend of intense training and fellowship under the guidance of Grandmaster Bobby Taboada. The event typically begins Friday night as people arrive, sign in, greet old friends, see the new faces, and pay their respects to GM. An impromptu meal usually follows. World Camp 2010. 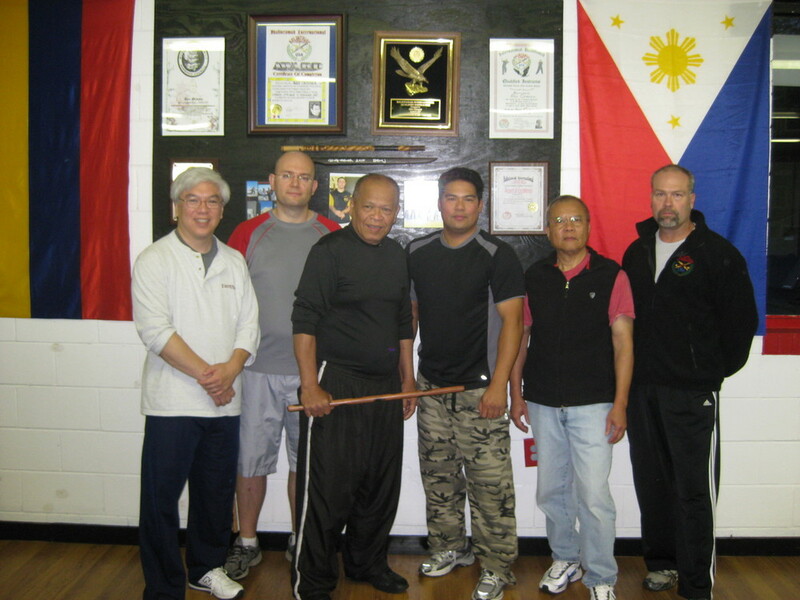 Richmond Balintawak founder, Jemar Carcellar receives his Level 7 Fully Qualified Instructor. World Camp 2010. Jemar Carcellar (Level 7), Pete Vatev (Level 6). Training typically starts at 9am on Saturday and runs into the late afternoon. A number of the visiting Level 7, Fully Qualified Instructors (FQI), are given time to show a number of techniques that they have been working on with their students. For the last couple of hours GM takes the stage, sharpening our skills, adding new perspectives to old techniques, and amazing us with new ones. While the amount of information can be overwhelming you must remember that the point of any seminar is not to leave remembering everything that was shown but to find the information that really enhances your particular style, with the amount of information shown here there is something for everyone. This is a chance for the flavor of each individual instructor and their school to be added to the larger stew of Balintawak. It is also a chance for practitioners to mix with students and instructors from other schools. This is where half of the magic comes into play because you not only get to see the variation between schools, you get to feel it. To meet someone from across the country, or possibly another continent, for the first time and have this language and art of Balintawak in common allowing you to instantly interface on such an intense and personal level is truly amazing. Locard's exchange principle is at play here: "Every contact leaves a trace". You both walk away from your encounter with something new and as a different person. With a brief pause for lunch, training wraps up around 5pm followed by a group dinner. This is the time to catch up with old friends and solidify new friendships. After dinner some most return to their lodging, but I guarantee you that there are some that are back to training because Sunday brings testing, and everyone wants to look good for the Grandmaster. Testing usually begins at 9am. Each time you test in Balintawak you begin at Level 1 and work up to your new level to show how your mastery has grown. While Levels 1 - 5 can be granted by Level 7 FQIs, testing for Levels 6 & 7 are only overseen by GM Taboada to ensure the quality of the practitioner. If you are lucky there will be someone testing for Level 7. To became a FQI you must bring a student through Level 6, Completion of the Art, and develop 24 of your own techniques. For your final test Grandmaster unsheathes his short sword and test your skills. It is an amazing thing to watch. Newer PostBig News in 2014! Older PostCongratulations Vinh & Matt!